Today’s Flash Back Friday comes from Episode 73, originally published in January, 2012. Andy joined the Liberty News Network as their National Correspondent in October 2010. He has given many appearances on TV and radio over the years. 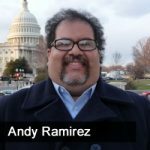 He also authored a comprehensive report titled “Unjustifiable and Impeachable, The FOBP Report on DHS, DOJ, and the Courts.” Andy was instrumental in the prison release of former Border Patrol Agents Ramos and Compean, and he has been extensively involved in the Jesus Enrique Diaz case. Andy has been featured frequently on CNN’s Lou Dobbs, FNC’s Fox and Friends, Neil Cavuto, and Hannity & Colmes. He has also been a guest on such programs as Michael Reagan, G. Gordon Liddy, Laura Ingraham, as well as many local TV networks and Talk Radio shows across the country.